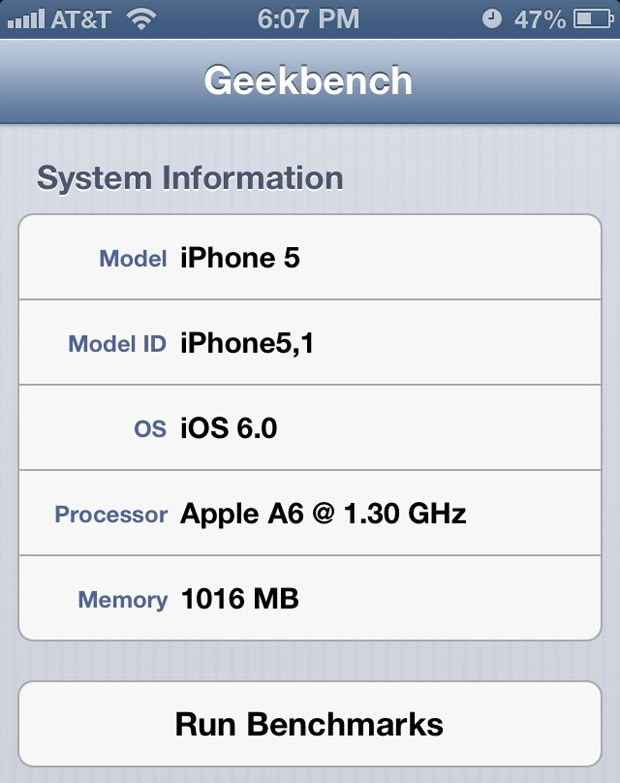 As the initial wave of iPhone 5 reviews hit, it looked as if Apple's dual-core A6 processor was sporting a clock speed of around 1GHz. We saw reports (and confirmed with our own handset) ranging between 1.00 and 1.02GHz, but a new Geekbench build (v2.3.6) has today revealed a horse of a different color. According to Primate Labs' own John Poole, the latest version of the app -- which landed on the App Store today -- "features a dramatically improved processor frequency detection algorithm, which consistently reports the A6's frequency as 1.3GHz." In speaking with us, he affirmed that "earlier versions of Geekbench had trouble determining the A6's frequency, which lead to people claiming the A6's frequency as 1.0GHz as it was the most common value Geekbench reported." When we asked if he felt that the A6 was capable of dynamically overclocking itself for more demanding tasks, he added: "I don't believe the A6 has any form of processor boost. In our testing, we found the 1.3GHz was constant regardless of whether one core or both cores were busy." Our own in-house iPhone 5 is regularly displaying 1.29GHz, while a tipster's screenshot (hosted after the break) clearly display 1.30GHz. Oh, and if anyone wants to dip their iPhone 5 in a vat of liquid nitrogen while trying to push things well over the 2GHz level, we certainly wouldn't try to dissuade your efforts.